The Exodyne – an all electric motorcycle – fuses rapid power with energetic, home-made engineering. Created by a veterinarian in Atlanta, USA, Alan Cross' bespoke bike is the result of nine months of research, design and fabrication work. The centre box frame houses 48 lithium polymer battery cells in a 100V 32 configuration, connects directly to the head stock with a swing arm pivot point. The Exodyne box frame is combined with a rear hub 11kW motor and sports a top speed of 60mph and a total range of 120 miles. 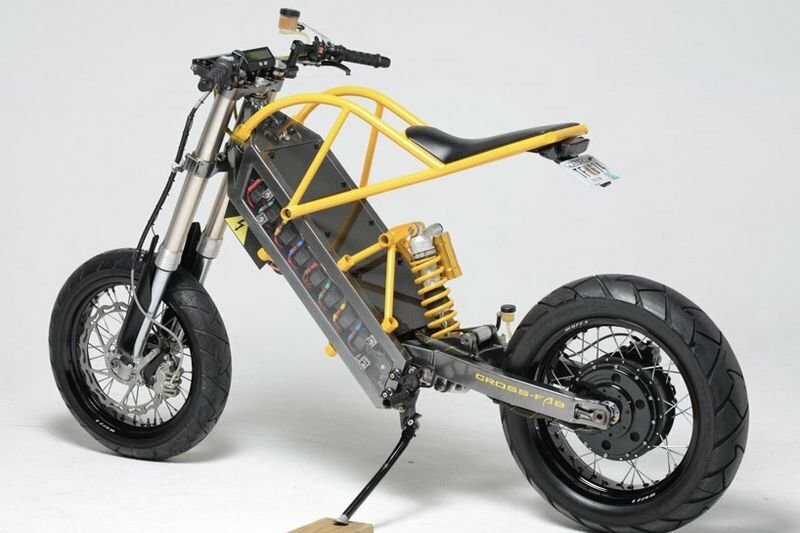 The electric motorcycle features bright yellow scaffold-like structures that shoot out to support the seat and rear suspension. Alan’s craftsmanship has also lead to the reuse of machinery from old motorcycles, this includes; a 2005 Suzuki ‘RMZ 250’ front fork, 1995 Suzuki ‘RM 125’ headstock and rear swingarm, Warp 9 wheels, Brembo front brake, and a Suzuki rear brake. Interspersed between this up-cycling, ‘Exodyne’ is fitted with carbon fibre to ensure a low kerb weight of just 249 lbs. The motorcycle is complete with a small Cycle Analyst heads up display that shows its mph, amps and total discharge, as well as other essential information. Indulge in the gallery above to see the beauty of the bright yellow Exodyne electric motorcycle. Worlds First Tesla Powered Audi... What? Are Electric Cars The Future? Fisker Car Company Patents A New Battery, Charged In One Minute! Video: The Updated Vw I.d Crozz Concept Driverless Electric Car Heading To Frankfurt!